We created this beautiful and tranquil oasis under the dappled shade of an old plane tree in the quiet residential, Highgate Village close. Sliding bi-fold doors open out onto a sunny, hardwood decked area at internal floor level. In warm months the deck provides an outdoor extension to the living/dining room with space for relaxing and alfresco eating. 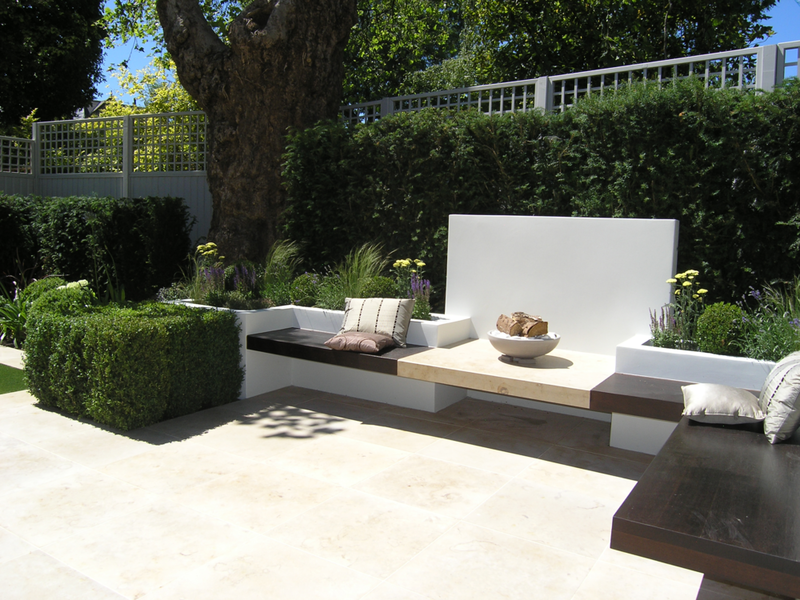 There are two outdoor sofas, a circular table and chairs for 6 – 8 people and contemporary white cube containers with Olive trees and seasonal flowering herbaceous perennials. Two steps lead down to a natural light limestone patio with a plant border to the right and a lawn area to the left. Ahead is an L-shaped rendered raised planter with under-lit floating hardwood benches and a central fire bowl focal feature. 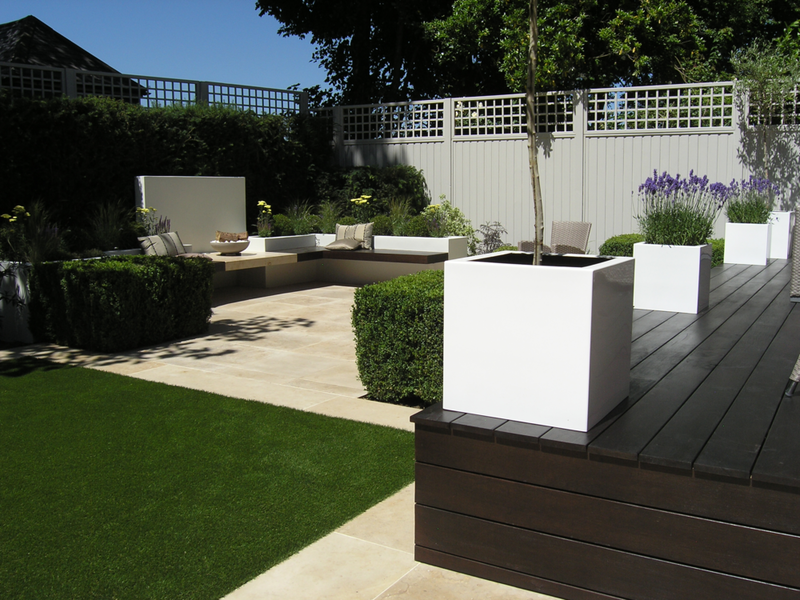 The planter has clipped box (Buxus) balls, contemporary grasses and flowering herbaceous perennials of contrasting colours, forms and textures. 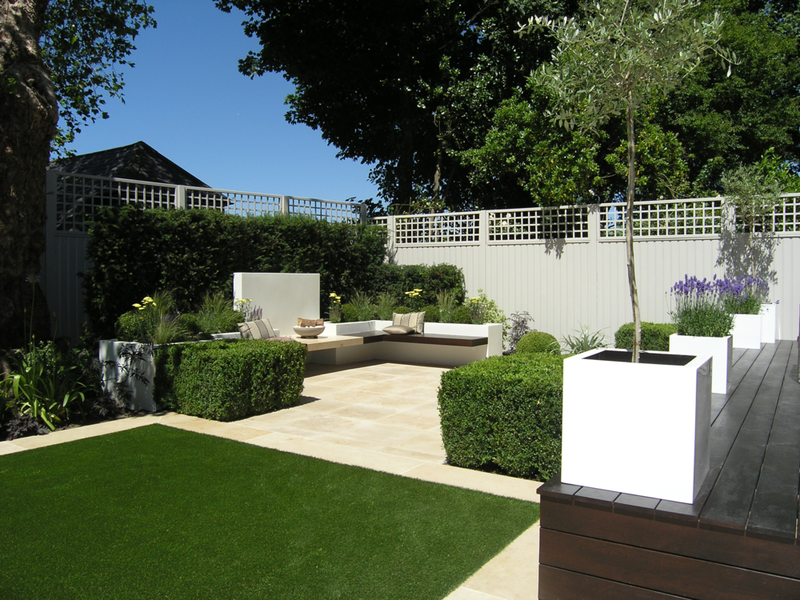 There are three blocks of clipped Buxus hedging at the same height as the raised planter and decking providing continuity and structure to this modern, North London garden design.There is a natural limestone surround to a pristine square, premium astroturf lawn. In the low maintenance borders, large clipped Buxus balls of varying sizes continue the planting scheme and contrast with strappy leaved plants such as Astelia and Phormium. Evergreen form, colour and leaf textures are provided with Fatsia, Heuchera and Pittosporum. In the summer, large blue ball flowers of Agapanthus Ovatus and graceful creamy green Hydrangea Arborescens lend height and colour. The whole scheme is enclosed with clipped Yew hedging and premium quality painted fencing and trellis in Farrow and Ball Cornforth White.